Tank Material: 12 GG SSTL 304. · Tank Material: 12 GG SSTL 304. · Tank Welds: Welded on outside of tank. · Weld Type: Mig and Tig welded and dye penetrant checked to insure water tightness. Water tightness then verified over a period of 2 weeks. · Internal welds are pacified per ASTM 967. · Outside of tank insulated with ceramic insulation. · Generator is individually fused and fan-cooled for a long, safe service life, and includes digital power intensity controls. · All inlets and outlet fittings are Tig welded on inside and outside of tank. · Tank fitted with manual fill valve connected to main water inlet. · Temperature sensing is done with internally welded tubing with thermocouples wired to PLC and HMI controls. Thermocouple has dielectric grease for better temperature readings. · 1” drain with ball valve and plugged fill ports included. · Optional Weir with Belt Oil Skimmer. Will be integrated in tank to insure maximum oil removal and cleanliness. o Optional > Spray bar and Weir for oil collection. See Below for Optional Item. · Heater System: Designed to maintain cleaning fluid temperature. Includes a 3200 Watt immersion heater with digital temperature controller. · Controls Weir & Spray Jet. · Filtration System: Stainless Pump & Stainless Filter Housing. · Auto Fill System with stainless steel inlet solenoid valve. · 7 Day Programmable Cleaning Cycles! · HMI controls would control cleaning parameters. · Daily Warm Up & Degas Programmable Cycles. · NEMA4X control enclosure includes Master Power Button with indicator light, E-stop, Manual Ultrasonic and dryer tank controls with digital temperature controller, ultrasonic generator indicator lights, control box safety access switch, and options controls. · Turnkey Auto-fill system; PLC controlled with overfill protection and HMI interface with programmable cleaning cycles. · Ultrasonic power cycle with an adjustable range from 10 minutes to 120 minutes. · Auto-fills the tank with water when liquid level drops. · Shuts down heat and ultrasonic when liquid level is low. 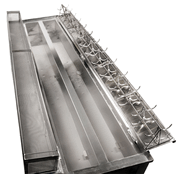 · Shuts down ultrasonics if temperature of tank exceeds 70 degrees C to protect transducers. · A general overview screen showing status of the whole system. · A set-point screen where the operator is able to reset the set-points such as temperature for the different zones of the equipment, processing time, weight limits, frequency of chemical add, etc. · Alarm screens for maintenance to evaluate the faults of the system. The alarm screens shall provide a history of all the alarms as well as provide the current alarm status. · A timer screen where idle/wake/run schedule can be entered or updated. · An input and output status screen. · In case of failure, a UPS unit shall assume an orderly shutdown of the PLC. Memory back-up shall assure proper cycle resumption when the power is restored. The system shall be capable of being operated in the automatic and the manual mode. The manual mode shall by-pass the PLC and shall allow maintenance to operate each unit of the system independently. A warning light shall indicate that the system is in the manual mode. · Heavy duty Forklift base. · Each tank has hinged air spring aided covers with EPDM vapor seal. · Insulated housing used to lower sound transmission. · Each tank has front discharge fittings. Discharge fittings are for emptying tanks and also for overfill protection. · Weight: Approx. 1200 lbs.